Note: I received a Diamond Candle to facilitate my review. All opinions are honest and are my own. I love candles. I love the ambiance they provide, the way the scent wafts through the house, and how you can almost set the mood for the house by which aroma you select. 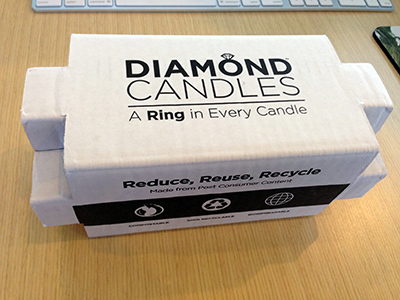 So, of course, when I was offered the opportunity to review a Diamond Candle, I said sure! I was impressed off the bat with the packaging. It’s simple and clean, and the box is an ingenious way to keep the candle safe and still easily accessible – just fold out the corners and the candle slips right out! I thought the design of the candle itself was really well done, too. It’s simple and modern looking, and doesn’t take away from the look of the candle when you have it out on the counter. 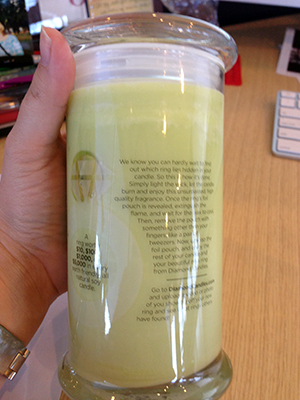 This is no ordinary candle, though… the back of the candle explains how each one contains a ring! If you look on the left side of the candle you can see a circle not far from my thumb. That is where a small gold foil pouch was positioned, and within the pouch was a ring waiting to be discovered. The rings are what really set Diamond Candles apart from others out there, but I can honestly say that the candles alone are worth the purchase. They’re a good quality (all-natural soy candles), the scent is really nice and they don’t burn too quickly. 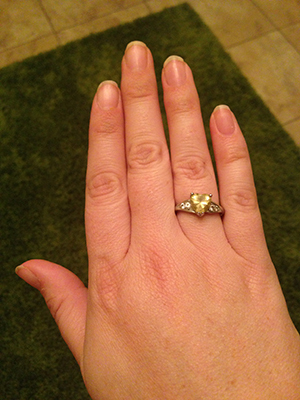 Which I guess can be a problem if you’re impatient and want your ring out NOW, but I like knowing that my investment in a candle will last me a while. The boys thought it was really cool that there was a ring hidden in the candle. Not that they’re interested in jewelry, but they thought of it like a treasure hunt and couldn’t wait to see what ring I got. I have to say I was a little curious myself, because there are some rings that are worth up to $5,000! Being 100% honest, this ring isn’t my style and isn’t anything I’d ever wear, but that’s not even a problem because there are Facebook pages where women go to exchange their rings. These candles are a phenomenon, and I didn’t realize just how popular they were until doing a little research for this post! I can understand why, though. Like I mentioned, the candles are good candles – but you get the added benefit of a fun surprise waiting for you… and who couldn’t use a little surprise now and then? 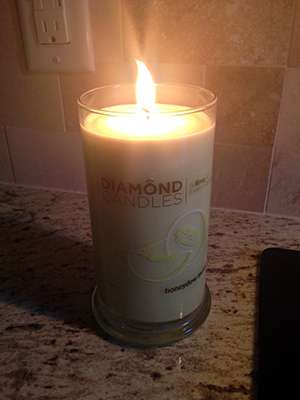 Diamond Candles retail for $24.95 each, which is comparable to other high-quality candles I’ve seen on the market. And to me it’s worth it to invest in a good candle; my friend had issues with her air conditioner filter getting dirty EXTREMELY fast, and found out it was from cheap candles she had tried burning in her house. The way candles affect your quality of air is something worth considering. 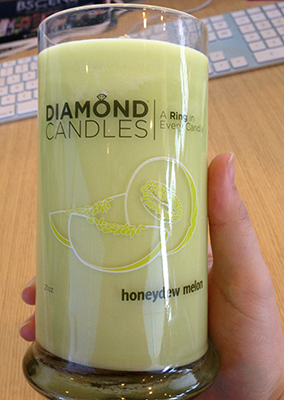 Not to mention that the scents from Diamond Candles are really good! I know I’ll be purchasing a Cinnamon Roll candle for the holidays! Britax Booster – Parkway SGL 2013 • Continuing Car Safety for Kids!